ISCEV Standard revisions: ERG, PERG, VEP, etc. This newsletter is published on paper (in grey) and on the web (in colour). First I should like to say how deeply honoured I am to have been elected to serve as ISCEV President in this year 2000, the beginning of the new millennium. I am honoured and, at the same time, humbled: well aware of the expectations and responsibilities I will be faced with in fulfilling this important role. They go beyond the scientific and clinical, important though these are, to include the character of our society. No other organisation has anything that can compare to the "ISCEV family spirit", which has been strengthened by the outstanding past Presidents, and I shall do my best to nurture this spirit. I first became a member of the ISCEV Board in 1989, when the Society was presided over by Prof Sven-Erik Nilsson. Thereafter on several occasions, both he and his successor, Prof Eberhart Zrenner, have taught me that goals can only be achieved through dedication and devotion. Upon his election 1992, Prof Zrenner set numerous objectives aimed at developing our Society, and their accomplishment is deeply appreciated by all members. Now that I have been elected the next President, I, too, have several goals in mind. I outlined them in my election statement, and I would like to enlarge upon them here. We must not only continue to receive, but also increase, the interest of our colleagues involved in other areas of ophthalmology. While we must strive to further develop the techniques and methodology of clinical electrophysiology, we also need to evaluate and understand the possibility of applying electrophysiology in other fields of ophthalmology. For example, I am a vitreo-retinal surgeon, proud of the fact that numerous new surgical techniques have recently been introduced in vitreo-retinal surgery to treat retinal diseases which were once difficult to cure. Nonetheless, problems still remain in restoring function in these cases. I feel it is our mission to publicise the value of electrophysiology in performing topographical or layer-by-layer analysis of residual retinal damage in these eyes. The information obtained by electrophysiology is extremely beneficial in targeting areas that cannot be treated by surgery, but must be dealt with by non-surgical treatment forms such as medication and/or other methods that I believe will become available in the 21 century. The further development of ISCEV-approved courses, and the standardisation of electrophysiological techniques are other powerful means of achieving this goal. While collaborative work between electrophysiology and other areas of ophthalmology is important, we should also extend our interest to the relationships and interactions between electrophysiology and other fields of basic science including optometry, biology, physics, engineering and genetics. One of the major ultimate goals of ISCEV is to improve the quality of electrophysiology for the best interests of our patients, which will enable physicians to link basic science and clinical application to supplement and strengthen the information obtained. I believe this is best approached on a regional basis. With the proposed change in status of the Secretary-General will come the opportunity for all the Regional Secretaries to focus more closely on activities within their region, and use them to strengthen the whole society. Already, valuable opportunities to introduce colleagues to the activities of ISCEV, and to recruit them as members, are being generated through such meetings as ISCEV@ARVO in the US, EVER in Europe and the Japanese and Chinese electrophysiology meetings in Asia. We can build on these. Since I am the first President to be elected from Asia, I believe my mission also includes improving the role of the Society in various Asian countries. An example would be to make sure that our Chinese members, who are limited from becoming full-members, become more active in the society. Nothing will underpin the intellectual growth - and the intellectual standing - of our society more than to have our own journal, the new Documenta Ophthalmologica, recognised internationally as the standard of excellence in this field. It won’t happen overnight; it requires a lot of hard work on the part of everyone, not just the Editor. We must all think of Documenta first when we are seeking to publish our new best work. Especially, the senior members of our society should set an example and I, as President, intend to lead the way. Having stated some of my objectives as the new President, I feel I must also share one of my main concerns, which is my lack of ability to speak good English. But, even though my English may not be as good as it should, my passion for the ISCEV is just as strong as that of all the past Presidents. I hope to receive support from the Board Members to overcome my English, while I will do my very best as the new President with a “Japanese heart”. Lastly, I would like to take this opportunity once again to express my deepest gratitude to all of you for the honour of electing me President. This time I will be brief, and I will begin by expressing my thanks to all who voted for me to continue for a further year as Secretary-General. It is a great honour to be asked to serve beyond the allotted term and I shall do my best to be worthy of the trust placed in me. The transition from one Presidency to the next is a good time to review our achievements and confront the challenges facing us. Well, I reviewed our achievements in the last Newsletter and I don't want our Society to become overly self-congratulatory, so let’s move on to the challenges. The most important is to make a success of Documenta Ophthalmologica now that it is our own Journal. We can dramatically improve our scientific standing and prestige if we succeed in this. And we can equally dramatically diminish it, perhaps to disappearing point, if we don’t. First and foremost we need to raise the Impact Factor. It’s easy enough to do: just send your best new work to Documenta first. Realistically, none of us wants to have a list of publications all in the same journal; that never looks good on the CV. But please publish in Documenta first, and then in the other journal. This way you’ll help ISCEV twice over - it’s what they call “double-dipping” on your frequent flyer programme! Let us strive to build a unique ISCEV character for the journal now that it is ours. Whilst we must look to, and learn from, other highly successful journals in the field, we should be very careful not to imitate them. They are already good at being themselves; let us ensure that Documenta is very good at being the ISCEV Journal. Another challenge lies in the field of education: educating others as to the value and benefits of electro-diagnostic techniques. Much has been achieved in this regard in recent years, but our resources are all-too-finite and perhaps we should pause to consider whether our targeting is optimal. It may be that a more local approach is appropriate, and perhaps we should empower our Regional Secretaries to build upon the good work they already do in this area. The proposal to de-couple the position of Secretary-General from Regional Secretary will help in this if it is adopted. The other proposed change to the bye-laws, which will increase the number of Members-at-Large will also help to involve more members in the running of our Society, and I commend this to you. We really do need to involve more of us: some of the challenges ahead are very demanding of resources. The success of our Standards Programme leads naturally to consideration of related issues such as Audit, Accreditation, Certification, Clinical Governance, CPD and so on. Can we afford to get involved in such as these? Can we afford not to? Several people have already written to me expressing their views about these issues, and I urge everyone who has a view to write to me. Not just about those I have listed, but about any which you feel are important in our field, and in which you feel ISCEV has a contribution to make. Let us move forward into the New Millennium (sorry, I couldn’t resist putting that in somewhere) with energy and unity to meet the challenges ahead. 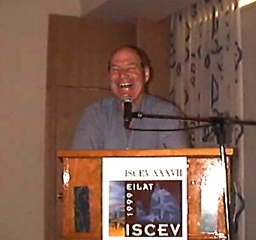 The 37th meeting of the ISCEV, ISCEV’s last meeting in the 20th century, took place in Eilat, Israel on April 10 to 15, 1999. 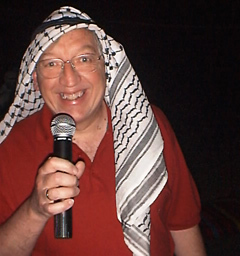 Our society has been in Israel already in 1975 at Kibbutz Nof Ginosar. I very vividly remember Edgar Auerbach, the organizer of this meeting from Hadassah University at Jerusalem. He introduced us not only to the most recent findings in retinal degeneration and to electrooculography which just had become part of regular clinical practice at that time but also to the life of the Kibbutz where we were staying and to the history of Israel from Massada to the Golan Heights. Almost 25 years later ISCEV again is hosted in Israel and we are very grateful to the organizer, Dr Ido Perlman and his hardworking group for the meticulous preparation, for selecting such a most beautiful setting for the meeting and, most of all for assembling the extremely attractive program. We have heard 58 lectures and discussed 20 posters and this scientific exchange will be guiding our work during the next year in clinical electrophysiology of vision. The Eberhard Dodt Award 1999 was given to Dr Hartmut Schwahn, carefully selected again among the younger colleagues who had come to Israel. The Eberhard Dodt Award very visibly is encouraging young scientists to stay in the field of visual electrophysiology and to work towards progress in this field. We also are very grateful to Mrs. Dodt, who was among the participants, for travelling so far in order to greet the recipient of the Eberhard Dodt Award. The 1999 travel grant awardees were: E.M. Lynch (USA), M. Takimato (Japan), S. Jalali (India), A. Grzybowski (Poland), and A. Iannacone (USA). The travel grant program is very important to us, in that it enables young scientists to come to our meeting, who otherwise very often could not have afforded to participate and to present their scientific papers. The International Society for Clinical Electrophysiology has become the leading society to maintain quality to objective function testing in ophthalmology, and related fields. During the last seven years of my presidency a number of goals were set and I am very glad that the committees and especially the membership have adopted such goals. We have a standardisation of all established electrophysiological techniques that have been published and revised. They have entered clinical practice in a world that has become global and that demands quality in a global sense. We have established a curriculum for a course program that educates along these standards and this course program has been not only been provided by ISCEV but (in the form of ISCEV approved course) has been multiplied by many members. It has also been adopted by other societies in Europe, USA, Asia and next year also a course will be held in Australia. We have established a grant program not only for travel but also for allowing young scientists to join colleagues in recognised laboratories as guest scientists. We have achieved in part improved remuneration for service quality in various countries and have provided the means to allow ISCEV members to prove that quality has its price. It becomes very clear that only those diagnostic laboratories that provide high quality and get appropriate remuneration can provide the services needed. We have fostered new developments by appointing guest speakers on most advanced technologies such as multifocal techniques, imaging techniques, brain scientists, retina physiology specialists, cell biologists, geneticists and molecular chemists among many others, in order to widen the scope of our discipline. Thereby we have succeeded in bridging the gaps between basic science and clinical application, between cell biology and systemic physiology, between understanding the normal visual system and understanding its pathophysiology, between academic research and scientists in industry. Our society has bridged the gap between the various sciences involved in function testing, ophthalmology, optometry, biology, physics, engineering genetics and even veterinary ophthalmology strengthen with pharmaceutical companies. Thereby our society has become attractive to those who are in the front of science and clinical application in this field. From 180 paying members ten years ago we have become now 365 paying members plus a large Chinese chapter who, due to unfortunate political situation, presently cannot become full members of our society. ISCEV always have respected difficult situations and has kept good relation with members from so called “countries with inconvertible currency” as we had carefully phrased it during the last 30 years. We have sent our regular issues and our Newsletter to members from these countries and we have paid special attention to their needs as much as we could. In the meantime many, such countries have become truly independent and the former members from countries with inconvertible currencies have now joined ISCEV as full members. We do hope that this, in the not too distant future, will apply to all members of ISCEV. It is our duty that ISCEV in its activities is not really hampered by ideology, borders, currencies what so ever. Hundred of thousands of patients during the existence of ISCEV have benefited from improved diagnostics, from therapeutic possibilities and from the information exchange. ISCEV always has provided the right platform for those who really do care. This development is almost exclusively due to the continuous work of the members and the officers of the society throughout this years. I would particularly like to thank the acting officers, the general secretary, Prof Colin Barber and the past editor, Prof Gerald Fishman, the present editor, Vernon Odom as well as to the past treasurer Prof Yozo Miyake and present treasurer Prof Adachi Usami as well as the vice presidents and the secretaries and the members at large. Particularly I would like to thank Prof Michael Bach for bringing the Newsletter to its new format in the internet for very successful dissemination of information. Most of all I would hope that what we might call “ISCEV family spirit” will be well preserved during coming years. ISCEV has be become a large family indeed among senior and junior scientists and among several disciplines across many countries and we can be very proud that this society during almost 40 years perseveringly pursued and achieved its goals in a competitive but friendly and rewarding atmosphere. It is my intense wish that the society may grow and prosper at least another 37 years and longer and that the support by the members and the officers of the board, which I was lucky to receive during the last seven years can be maintained continuously. I hope that this support will be given to future presidents as well, together with the little luck we always need to guide a ship of this size through uncharted waters. and so this regular large expense is not shown this year. The XXXXth ISCEV Symposium in 2002 will take place in Leuwen, Belgium. It will be organised by Werner Spileers. The Western Hemisphere Division of the ISCEV meeting, also known as ISCEV@ARVO, was held May 8, 1999, at “Martha’s on the Intracoastal”, Hollywood Beach, Florida. Sara Putney was the Administrative Associate in charge of organizing the conference. Drs. Richard Weleber and Bill Dawson chaired the sessions. Mr. Ken Hansen of Hansen Ophthalmic Development Laboratory helped to fund the conference and scientific sessions. Sixty-one participants from around the world attended. The first session of the afternoon was devoted to “Multifocal ERG and ERG Components and Techniques.” The second session focused on “Electrophysiology in Clinical Disease, Animal Models, and Other Topics.” Fifteen presentations were given during the two afternoon sessions. The dinner which followed was attended by members and guests. The 2000 ARVO@ISCEV meeting will be held Saturday afternoon, 1:00-6:00 PM, April 29th, at the Fort Lauderdale Convention Center, 1900 S.E. 17th Street Causeway, Fort Lauderdale, Florida. Free parking will be available in the same structure used for the ARVO meeting. Following the scientific sessions, a gourmet buffet dinner is planned for the participants and their guests at the Convention Center. You can register for the scientific sessions and dinner, or either separately. Please contact Carolyn Weleber, who is temporarily replacing Sara Putney (who has retired), at 503/494-8386 or by email (weleberc@ohsu.edu) for registration and further details. Japan. The 47th annual meeting of Japanese Society for Clinical Electrophysiology of Vision was held at Niigata City from July 2nd to 3rd 1999 by Prof Haruki Abe in Niigata University School of Medicine. Participants were 203 in the meeting and educational course. Two invited lectures (by Prof DC Hood and Prof Y Miyake),4 educational lectures, one symposium about difficult cases for clinical diagnosis and 38 free papers. The next meeting will be held in Morioka city from September 28 to 30, 2000 by Prof Dr Yutaka Tazawa in Iwate Medical University. Prof Kazuo Kawasaki in Kanazawa University will be a new president of Japanese Society for Electrophysiology of Vision from 2000 in succession to Prof Dr Yutaka Tazawa in Iwate Medical University. Australia and New Zealand. The meeting in Sydney will be a success with 140 abstracts received, 162 registrants, 5 trade displays and 45 accompanying persons. and a good registration in both courses (28 standard & 42 multifocal). One of the keynotes will be a lecture by Prof Arden who has finally managed to isolate the ‘light rise substance’ which causes the EOG potential to be transferred from the retinal to the choroidal face of the RPE in the light rise by a study of a similar effect caused by small doses of alcohol.  A clinical trial of the multifocal VEP and ERG as a test for the field loss following Vigabatrin use is running at Sydney University Dept of Ophthalmology under the direction of Dr Stuart Graham and Alexis Klistoner.  There are new systems installed at the Medical Physics Dept Uni of Western Australia, the Childrens Hospital in Melbourne, and the Dept of Ophthalmology, University of Queensland, (all LKC!). The Medical Physics dept Uni of Western Australia is also planning to buy a Sutter system. This department is also setting up a website for communication between visual electrophysiologists around Australia. Due to the large distances we have here, there are no local ISCEV type meetings except a more general 2 day visual science meeting of all vision scientists. It is called the Australian Ophthalmic and Vision Science Meeting. It is sponsored by the Ophthalmic Research Institute of Australia and combines work by Ophthalmologists, Optometrists, and basic vision scientists. It is in the first weekend of each November. That meeting, though short, is enough to cover all the work done in Australia and is published in the Aust and NZ J Ophthalmol each Feb. Seven members, Prof DZ Wu, et al. have published a Book “Clinical Electrophysiology of Vision” Chinese Version, 1/16 k, 447 pages, this year. The publisher, Science Press, is a high quality publisher in China. All ISCEV-CB members received 45% discount. The next ISCEV-China Branch Symposium will be held at November 9-10, 2000, in Guangzhou, China. This will be a joint meeting together with the 12th Afro-Asian Congress of Ophthalmology. Profs Miyake, Zrenner, Galloway, and Holder were invited for lectures. This year, as last, ISCEV had a strong presence at the annual conference of the European Vision and Eye Research (EVER) conference. The meeting was held in Palma de Majorca during October 6-9. It included an invited session on “Clinical Applications of Electro-diagnostic Techniques”, organised by the Vice-president for Europe and Africa, NR Galloway. Speakers were G Holder (UK), H Spekreijse (Netherlands), I Comaish (UK) and P Lachapelle (Canada). The conference also attracted sufficient proffered papers on electrophysiology to generate another session in the Visual Science section, and was generally judged to be a clear success. The next meeting will be held in Palma from 4-7 October 2000. During the summer (June 28-July 2), the European Congress of Ophthalmology (SOE), was held in Stockholm, and included a teaching workshop on clinical electrophysiology of vision. The speakers included C Barber, G Holder, U Kellner and E Zrenner. ISCEV has been invited to organise a similar teaching workshop at the next European Congress of Ophthalmology (SOE) in Istanbul in 2001. A much more substantial, and fully ISCEV-approved course was held at Moorfields Eye Hospital in London. This annual event continues to attract a full attendance, with participants from all corners of the globe. Non-English language courses were also organised by ISCEV members in Germany and Italy. It was, overall, a good year for education. The growth in the number courses over these last few years is encouraging. Perhaps, though, it is time now to take stock of the somewhat disparate nature and context of these educational offerings in clinical electrophysiology of vision. Probably the field is mature enough for a formal strategy to be formulated and put into action. It is a task I commend to my successor! This year my term as Secretary for Europe and Africa comes to a close. There has certainly been a growth in Regional ISCEV activity over these years, but there is scope for much more. I hope the proposed changes in the bye-laws will facilitate this. Thank you all for your support during my period as Regional Secretary. Florence Rigaudière <rigaud@ext.jussieu.fr > provides us with additional details on French Meetings.COURSES: For more than 10 years, the team of electrophysiologists at University Paris 7 (CHU Lariboisiere-Saint-Louis, Service de Biophysique Departement vision: Dr Ingster-Moati, Le Gargasson, Rigaudiere, Rosolen; information: Dr Rigaudiere fax: 33 1 44 89 78 23, email:rigaud@ext.jussieu.fr) has been teaching every year a 130 hour high level course of visual electrophysiology, attended by ophthalmologists, researchers, optometrists and nurses. Veterinarian ophthalmologists can also attend courses or seminars devoted to clinical investigation or research on animals (information: Dr Rosolen fax: 01 41 13 89 89 email: rosolen@club-internet.fr). SEMINARS: The seminar “Actualite en Exploration de la fonction visuelle” (Update on investigation of the visual function) will take place in Paris on Saturday, 30 September, 2000. This seminar will gather scientists and doctors who want to hear specialists about the latest developments of electrophysiology. Many experts from abroad attended previous seminars. For example, our ISCEV friends Pierre Lachapelle and Werner Spileers presented their subjects of excellence in 1997 and 1998 and Michael Marmor honoured us with his presence in September 1998. This seminar is open to anyone interested. If non-French speakers wish to attend, English summaries will be provided. Information: Dr Ingster-Moati email: isamoati@ext.jussieu.fr or fax: 33 1 49 95 81 08. Do not hesitate to attend. This seminar is very convivial! The meeting is opened at 10.30 by the President, Professor Zrenner in the Lecture Room, Ambassador Hotel, Eilat, Israel. 51 members are present. The minutes of the 1998 Membership Meeting are accepted as a true record and signed as such by the President. There are no matters arising. The Secretary-General (Professor Barber) presents his report for 1998, which has been published in the Newsletter. There are no matters arising from it. The Secretary-General presents the report on behalf of the Treasurer and points out that this is a transitional report between Prof Miyake and Prof Adachi. 5.1 The Editor (Dr Odom) gives his annual report. There have been 39 submissions during the year, with a rejection rate of 21%. He comments that this is relatively low compared with other journals, but that the standard enforced by the referees is high. He outlines the reviewing process. Zrenner reminds members that papers can be submitted at any time. 5.2 Odom introduces the need to come to a decision on future publication plans. He reviews the history of publication, from a conference proceedings book in the early years through to a fully peer-reviewed journal. He states that the relationship with Kluwer, publishers of Documenta Ophthalmologica has been generally good, though there have been some problems with distribution. For our own part, we experience problems with flow of papers. Now the contract is due for renewal and there are two options, both attractive in their own ways. One is to continue with Documenta Ophthalmologica, but with the non-ISCEV issues discontinued, so it becomes wholly an ISCEV journal. The other is with Vision Research. Zrenner details the relative merits and demerits of the two offers, including financial considerations, and concludes by reporting that the majority Board recommendation (with two abstentions) is to accept the Documenta Ophthalmologica offer from Kluwer. He then opens the topic to the floor and there is much discussion. Lachapelle asks about the name of the journal. Zrenner replies that Kluwer is anxious to continue the name Documenta Ophthalmologica because it is well-accepted by libraries, but that ISCEV is free to choose sub-title and intends to do so should ISCEV accept the offer. A lot of discussion centres on the Impact Factors of the two journals; Vision Research has a significantly higher IF than does Documenta Ophthalmologica. However, the view is put by many that we have it in our own hands to raise the IF. This process will be helped by the fact that an ISCEV journal will be much more focussed than the old Documenta Ophthalmologica, with its additional general issues. Vaegan points out that if we publish in Documenta Ophthalmologica first, and then in other journals, citing the first publication, this will quickly raise the IF. Robson comments that review articles and tutorials are very helpful in raising the IF and we should commission these from among our members. Lyons feels that publication of Clinical Case Reports will increase readership among clinicians. The meeting decides, by show of hands, not to follow this decisive vote by a mail ballot. 6.1 President. Position vacated by Zrenner, who is not eligible for re-election, having served two terms. Zrenner presents the Board's candidates, Marmor and Miyake, and asks if there are further nominations from the floor. There are none. In the absence of the two candidates, the meeting approves by the majority of > 50% each of these candidates, and so they will both go forward to a mail ballot of all members eligible to vote. 6.2 Secretary for Europe/Africa. Position vacated by Barber, who is not ineligible for re-election, having served two terms. Zrenner explains the Board's decision to extend Barber's term of office as Secretary-General (and therefore Secretary for Europe/Africa for a further year to avoid changing both President and Secretary-General at the same time. He further explains that, although Barber has served two terms, the bye-laws permit his re-election in the absence of any other candidates. He asks that, if the membership agrees, it refrain from nominating any other candidate, and opens the matter for discussion. (Barber leaves the room and returns when invited, upon completion of the discussion). Barber is elected unanimously for a further special one-year term of office. Zrenner extends the discussion to the general problem of synchronisation and promises to put forward a proposal to next year's meeting, to change the bye-laws to prevent this kind of situation from arising again. 6.3 Treasurer. Position filled on an interim basis by Adachi, who is the Board's candidate for the definitive position. Zrenner informs the meeting that Adachi has expressed her willingness to stand and asks if there are further candidates. There are none. Adachi is elected unanimously as Treasurer. Vaegan makes a presentation, describing the facilities he has set in place for the meeting in Sydney, and urges people to pre-register on the website so that he can gain an indication of attendance. (2) Visual electrophysiology and genetics: from animal models to clinical application. 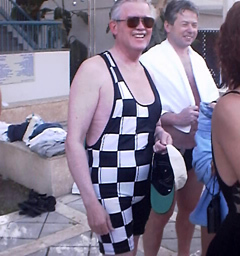 He says that he is currently evaluating out-of-town venues which will be very pleasant in the summer. Zrenner reports that a choice between Leuven, Belgium (Spileers) and Cairo, Egypt (Spekreijse) will be made by the membership in response to voting information/forms in the next Newsletter. Zrenner announces that there has been an invitation from Nagoya (Miyake) and reports that the Board is strongly in favour of accepting this invitation. Barber reminds the membership that the 2004 meeting must be in the Americas. Dawson offers Puerto Rico. Perlman reports that approximately 150 participants have attended in total. He says that he has received support from some companies, including LKC, even though they are unable to attend. Marmor presents the final version of the revised standard. This is unanimously accepted for publication.  Paediatric electrophysiology (Fulton). This is accepted. Fulton is asked to convene a group, with the assisstance of Barber, and to report back on progress next year.  Motion potentials (Kuba). Bach suggests that this is too specialised, and this view is upheld. Vaegan suggests that a review article might be useful in going some way towards meeting the aims of the proposer.  Certification (Vaegan) There is a general agreement that this may be beyond the resources of ISCEV at the present time. But the importance of the issue is acknowledged, and a watching brief will be maintained. This year’s Eberhard Dodt Award was given by the adjudication panel of the International Society for Clinical Electrophysiology of Vision (ISCEV), consisting of the three vice presidents and the secretary general to Dr Hartmut Schwahn, a 31 year old biologist from the University Eye Hospital in Tübingen, Germany. The award is given for the best presentation at the annual meeting to a young scientist (below 35 years old) according to scientific excellence, the novelty and potential value and/or clinical usefulness and the quality of the presentation (taking into account the native language). At the meeting in Eilat Dr Schwahn presented a poster entitled “Effects of local anaesthetics on light evoked potentials of the in vitro retina”. He provided the first description of the effects of atropine and procaine on the standing potential of the retina, using an in vitro-retina-preparation in the so called “USSING chamber”. He has shown novel possibilities to dissect functions of the retinal neurones and the retinal pigment epithelium. He intents to elaborate on this topic in coming years and certainly the Eberhard Dodt Award will help him to do so. 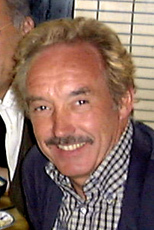 Dr Schwahn has received his biology diploma in Tübingen in 1993. Subsequently he worked for one year on the in vitro preparation of the retina in the laboratory of the late Prof Steinberg in San Francisco, who was also a member of ISCEV. Dr Schwahn continued this work from 1995 to 1998 in Tübingen, investigating the role of muscarinic transmission and of the retinal epithelium in experimental myopia in chicken. Currently he holds a postdoctoral position in the laboratory of Dr Schaeffel in Prof Zrenner's department in Tübingen. “The award commemorates the life and work of Prof Dr med. Dr med hc Eberhard Dodt, Director of the Max-Planck-Institute in Bad Nauheim. He has served for many years on the board of ISCEV. He has received many honours from the Japanese Emperor, from the German Bundespräsident Weizsäcker and from several universities. But I think he would like best --if he knew-- that after his death in 1994 his friends made a donation which laid the basis for the annual Eberhard Dodt Award. Eberhard Dodt encouraged and supported over hundred young scientists and some of them are present here today. In difficult years he maintained close ties with laboratories in the eastern block and many young colleagues from Poland, Tsech Republic, Romania, Bulgaria got the chance to work in his laboratory besides the many scientist from Japan, England and United States. It is both a pleasure and honour for me that, on the occasion of the ISCEV Symposium --it is now the fourth time, after Tübingen, Monterey and Prague-- that I have again been invited to present to a young scientist the scientific award named after my late husband. Research by young scientists always lay close to the heart of Eberhard Dodt. I look upon this award as his legacy. Throughout the history of mankind there has always been an urge towards discovery and human inquisitiveness has given a boost to evolution. As long ago as 1597, Francis Bacon, who regarded the mastery of nature as a goal of science, expressed this thoughts as follows: “For knowledge itself is power”. And this power is, I believe, the product of inquisitiveness. In medical research especially , which charts the path to conquer illness or, at least, to alleviate the suffering of the sick, it should be our guideline and our goal to use this power for the benefit of mankind. Further we are conscious of the universality of science and of the fact that it also crosses national frontiers precisely in countries where peace does not prevail because such countries have not found a modus vivendi. Thus science contributes to understanding between people. Yet gladly would I know everything”. To undertake one’s research according to this principle is difficult, but it will be successful. May your future scientific work likewise be crowned with success! Thank you, and Shalom al Israel. We begin the new millennium with an exciting set of prospects and challenges before us. At the membership meeting in Eilat, the ISCEV members voted to make Documenta Ophthalmologica the official journal of ISCEV. Documenta Ophthalmologica is an official publication of the International Society for Clinical Electrophysiology of Vision. The purpose of the journal is to promote the understanding and application of clinical electrophysiology of vision. Documenta Ophthalmologica will publish reviews, research articles, technical notes, brief reports and case studies which inform the readers about basic and clinical sciences related to visual electrodiagnosis and means to improve diagnosis and clinical management of patients using visual electrophysiology. Studies may involve animals or humans. In either case appropriate care must be taken to follow the Declaration of Helsinki for human subject or appropriate humane standards of animal care (e.g., the ARVO standards on Animal Care and Use). Part of our agreement with Documenta's publisher, Kluwer, is to fill 6 issues per year. This past year, 1999, is the first year in several in which we filled 5 issues. I have written previously about difficulties with the journal. To overcome our difficulties and create a viable journal of six issues per year will take all of us working together. It may seem strange but the best solution to all of the journal's problems is more quality submissions. More quality articles results in a lower turn around and shorter publication delays. One of the greatest causes of delays is waiting for enough accepted articles to fill an issue. Therefore, we welcome not only articles directly related to clinical electrophysiology of vision but articles that are related to clinical vision sciences. One might note that the first issue of our new journal will be an issue filled by articles on the history of ophthalmology. We also welcome sister societies to suggest special issues to us. There has been a moderate increase in the number of regular submissions, which helps us toward our goal of having 6 complete issues per year. However, we still fall short of that goal. Special Issues will continue to have a valuable role to play in keeping our numbers up. At the present time we have a number of special issues planned. However, there is a danger with special issues with a bi-monthly journal. If we have a sufficient number of quality articles to fill an issue a special issue delays their publication by at least two months! I welcome comments about problems and suggestions of improvements in the journal. During the past year I have received several and have incorporated most of them. Especially if you are suspicious that something is taking too long, contact us. It probably is taking too long and we have overlooked something. You may send such comments either by regular or email to me, jodom@wvu.edu, or to the managing editor, Ms. Karen Murray, kmurray@hsc.wvu.edu. LKC Systems Users-group. Our Department, which has been involved in Visual Electrophysiology for over 20 years, is interested in establishing an LKC UTAS Systems Users-group (essentially via email). We purchased a UTAS-E 3000 eighteen months ago and little ‘first-hand’ information from experienced users was, or is, available. As there are now many systems being used internationally, such a group set up for dissemination of information may be beneficial for all those involved. If you wish to be included, please contact me at the address below, and I will be happy to enter you into a register of LKC UTAS-users. I am writing this to ask you for some help in getting used ERG/VEP equipment for a new lab in Poznañ. We look also for some ERG apparatus for animal studies. Since the equipment is still very expensive, we would be most satisfied with the used one. I humbly ask all ISCEV colleagues again to ask for your help. 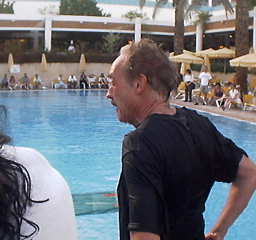 The 37th Meeting of ISCEV took place in the Ambassador Hotel, Eilat, Israel, from April 11-April 16, 1998. 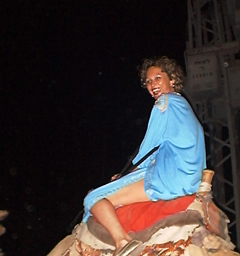 I would like to thank all the ‘brave’ participants and accompanying persons who came to Eilat for this ISCEV meetiing. My “non-biased” opinion is that the meeting was a great success in all regards. The scientific program was excellent and stimulating. New ideas on expanding the scope of clinical electrophysiology of vision have been raised. It seems that the use of multifocal ERG and VEP for clinical applications is gaining momentum. Another expanding area of research is the use of transgenic and knockout animals to study the development of retinal diseases. The oral presentations were of the highest quality and triggered heated discussions that were stopped only by the firmness of the chairpersons of the sessions. All the posters were of the highest scientific level and all were prepared with great thought about the quality of presentation. In fact, the Dodt prize was awarded this year to Dr Schwahn from Tübingen, Germany for his poster. A new session has been started in the 37th meeting of ISCEV. It is called “The History Zone” and is dedicated to history and mystery of clinical electrophysiology. The speaker was Prof Henk Spekreisje who discussed the identity of the first person to record the EEG. It was an excellent talk combining historical facts and detective work. I hope that this session will become a new tradition for future ISCEV Meetings. The social program was also very successful. We had excellent dinners including BBQ around the pool and on the shore of the Red Sea. I apologize for all those (including myself) who gained weight in the meeting. 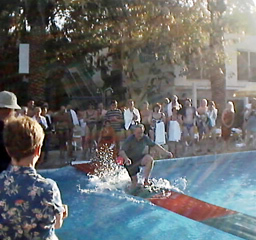 Several of the participants demonstrated unknown skills in walking on water, floating on water and belly dancing. I have enjoyed every minute of the meeting. The success is due to many. I would like to thank the staff of Ambassador Hotel for the excellent service, for their dedication and creativity. The members of the organizing secretariat; Adi, Gabi, Yael and Dvori were super and I want to thank them for their imagination and thoughtfulness and for thinking on every detail of the meeting. The people of Eshet Travel Agency helped us in all the organizational details from reserving rooms and flights, organizing the tour to Massada and the post symposium tours and were available whenever needed. However, above all, the success of the meeting is mainly due to those of you who came to Eilat and participated in the meeting. 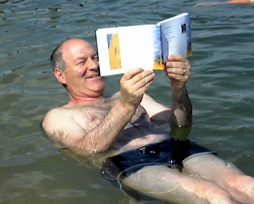 The organizer Ido Perlman, while floating in the Dead Sea during our mid-conference trip, finds out that it is too late for changes in the programme. The ISCEV olympics left their organizer, our normally distinguished Secretary General, dripping wet, somehow. ...successor Eberhart Zrenner paving the way to the future. President Eberhart Zrenner is obviously enjoying his “thank you speech” in local atire. Photo #1 by Colin Barber, others and commentary by Michael Bach. A European veterinarian ERG harmonization committee was created at the last joint ISVO, ESVO meeting in LYON, September 21, 1999. This committee is composed by Drs. Bjorn EKESTEN (S), Kristina NARFSTROM (S), Ron OFRI (IL), Christine PERCICOT (F), Serge ROSOLEN (F) and Bernhard SPIESS (CH). Kristina NARFSTRÖM was elected to serve as committee Chairwoman, Ron OFRI as committee Secretary and Serge ROSOLEN as committee Treasurer. The primary aim of this committee is to harmonize protocols for ERG recordings in Europe. It is hoped that the harmonized European protocol will be discussed and adopted by other international veterinary organizations, thus serving as the basis for a worldwide veterinary ERG protocol. The support of ISCEV could make a big contribution to the field of veterinary visual electrophysiology and helps development of comparative ophthalmology. ISCEV-approved Courses. There were three ISCEV-approved courses held during 1999. ISCEV-approved course are held regionally, are sponsored by local organizers, and the course language is usually that of the host country. The course content is developed by the organizers but must be presented to the Education Director in order to achieve ISCEV approval status. ISCEV-approved courses must have at least one ISCEV-approved Instructor. ISCEV-approved instructors include all present and former board members of ISCEV and those who have applied for and have been approved by the Education Director, the Education Committee, and the Board of Directors. Presently the only two members who have applied for and received ISCEV-approved instructor status are Dr A Patricia Tormene and Dr Ulrich Kellner. Sweden. A four hour course of lectures and practical training was given in association with the SOE99 meeting in Stockholm. Drs. Colin Barber, Eberhart Zrenner, Ulrich Kellner and Sven Erik Nilson participated. This was not an officially ISCEV-approved course but was similar to the course at SOE97 in Budapest. United Kingdom. An ISCEV-approved course with 33 registrants was organized by Dr Graham Holder and held February 16-19, 1999, at Moorfields Eye Hospital in London. Course instructors were Drs. Graham Holder, Geoffrey Arden, Günter Niemeyer, Alan Bird, Anthony Kriss, Paul Riordan-Eva, and Chris Hogg. Dr Holder and the same faculty plan to present this course again, March, 2000. Italy. On September 30, October 1, 1999, a two-day ISCEV-approved course was given in Padua, Italy, organized by Dr A. Patricia Tormene. Course instructors were ISCEV members Drs. Vittorio Porciatti, Roberto Magni, Claudio Macaluso, Alma Patrizia Tormene, Vincenzo Parisi, Gennaro Ambrosio, Leopoldo Spadea, Mathias Seeliger and Prof Mario Anastasi. Other Lecturers included Prof Adriana Fiorentini, Prof Riccardo Frosini, Dr Paolo Perissutti, Dr Benedetto Falsini, Dr Stefano Fabris, Dr Roberta Busana, and Orthoptist Chiara Riva. Germany. The 3rd Berlin Electrophysiology Course for Ophthalmologists was held October 8-9, 1999, in the Eye Department of the Benjamin Franklin University Clinic, Free University Berlin. This was a one and a half day ISCEV-approved course that presented all ISCEV standardized methods as well as the mulifocal ERG and included both theoretical and practical sessions. Course lecturers were the following ISCEV members: Drs. M. Bach, K. Ruether, E. Lapp, M.H. Foerster, and U. Kellner. The 4th Berlin Electrophysiology Course for Ophthalmologists will be held October 13-14, 2000, at the same place. Other courses were given that were not officially ISCEV approved. Electrophysiology courses were given in 1999 in Munich by Dr T. Berninger and another course was given in Tübingen, although these were not registered as ISCEV-approved courses. 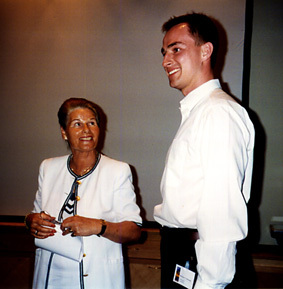 In March of 2000, two 2-hour courses will be held during the German Ophtalmologic Academy, one on EOG and ERG (Drs. Zrenner and Berninger) and one on VEP, mERG, PERG (Drs. Kellner and Bach). Both courses will mention ISCEV in their course and handouts (about 60 participants are expected in each course). Japan. An educational lecture course on visual electrophysiology was given at Niigata University School of Medicine July 3, 1999, as part of the 47th Meeting of the Japanese Society for Clinical Electrophysiology of Vision. The course organizer was Prof Dr H. Abe. The Lecturers were Prof Dr K. Ukai, Dr I. Iwase, Dr T. Usui, and Dr H. Hasebe. There were 91 participants in the course. 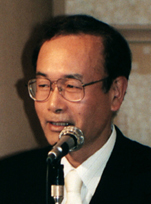 The next educational course will be organized by Prof Dr Y. Tazawa at Iwate Medical University in September 28th, 2000, before the 48th Meeting of the 47th Meeting of the Japanese Society for Clinical Electrophysiology of Vision. The ISCEV-Sponsored Teaching Course. The content of the ISCEV Teaching Course is developed by the Educational Committee of ISCEV, and this course is always given in English. As Education Director, Dr Richard Weleber is the Director of the Course but local Coordinators play a major role in organizing the sessions and the practicum. No ISCEV-Sponsored Teaching Course was held in conjunction with the 37th ISCEV Symposium that took place April 11-16, 1999, in Eliat, Israel. For the year 2000, a two day course will be given in Sydney, Dr Vaegan is the Course Coordinator. Participants in the two-day course will receive didactic lectures as well as "hands on" experience" in practicums. The basis of testing and the specifics of ISCEV-approved techniques are presented for the ERG, EOG, PERG, and VECP. The faculty consist of instructors designated by the Education Committee. LKC, Roland Consult, and Espion (aka CED or Doran Instruments) will provide equipment for the practicums. Electrodes for use by the attendees during the practicums will be provided by Mr. Chris Hogg (the gold foil electrode), Dr Colin Barber (the C-glide electrode), and Dr Marko Hawlina (H-K electrode). The new version of the ERG standard (“1999 Update”) is published (Documenta Ophthalmologica 97:143-156). It is also available on-line from the ISCEV internet site (<www.iscev.org>, look for ‘Standards’ in the top navigation bar to view the appropriate web-version). The new Standard broadens the range of intensities for the Standard Flash, but of course once this change was approved some concerns have arisen (e.g. problems defining the rod stimulus, and problems developing general norms) -- so there has been a groundswell of opinion to go back to the original values. I welcome comments and opinions, and the issue will be discussed and perhaps resolved in Sydney. Watch this space! The Guidelines for Pattern Electroretinography have been reviewed by a committee headed by M. Bach. The committee met two times during the 1999 meeting in Eilat, further exchanges were effected through internet discussions. The committee feels that the time is ripe to publish a Standard for the Basic Pattern ERG. The revised version is available on-line at <www.iscev.org/iscev/standards/perg.html>, a printed version is distributed with this newsletter. Please take the time to review the proposal. During the 2000 meeting we will meet to discuss the status of the manuscript, possibly a revised version can be submitted to the membership meeting to vote on. I would like to thank all members of the committee for lively, inspired and constructive discussions. It is time to revise the ISCEV VEP standard. There was a meeting to discuss changes at the meeting in Israel. However, we really did not get very far. Therefore, we have scheduled two meetings in Australia. If you wish to suggest changes in advance please email your suggestions to Dr J. Vernon Odom at jodom@wvu.edu. You may also contact Dr Odom by slow mail at Department of Ophthalmology, Robert C. Byrd Health Sciences Center, West Virginia University, P.O. Box 9193, Morgantown, WV 26506-9193. These three compilations are currently up-to-date and can be viewed at the ISCEV website <www.iscev.org>. We have had an ISCEV web site since 1996. However, as of July 1999, ISCEV has its own internet domain <www.ISCEV.org> (capitalisation does not count here, but it looks nicer :-). Apart from information on our society, it provides direct access to the ISCEV standards. My intent was to create a site with more content than glitz, loading rapidly, scalable to all screen sizes, and not relying on fancy features of the most recent browser version. Please check it out; I would welcome constructive criticisms. On this web site, there is also a list with the members' email addresses, and homepages, if known. Please validate your entry, we still have a large number of errors there. I regret to inform you all that our friend Jerome Leight passed away recently in his home. His wife, children, and brother were with him. He battled an incredible 8-month fight with pancreatic and liver cancer, and never gave up hope. 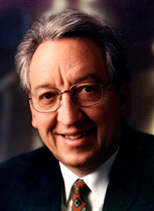 Jerry had been an important contributor to clinical electrophysiology through his promulgation of instruments that made ISCEV Standard testing practical, and he was a long-standing supporter of ISCEV. The XXXVIII Symposium is to be held in Australia from Sunday, February 13 through Thursday, February 17, 2000. The organisers are Vaegan <vaegan@unsw.edu.au> and colleagues. They have set up a comprehensive website at www.iscev2000.unsw.edu.au/iscev/. They proudly report a high attendance --well deserved-- which exceeds both Colin Barber's and Vaegan's high bets. On-site members: Pierre Lachapelle, Michelle McKerral, Jaqueline Orquin, Marie Sylvie Roy. Off-site members: Stuart Coupland, François Tremblay, Carol Westall. Representative of the veterinary community: Serge Rosolen (Paris). Pierre Lachapelle, for the organizing committee. The XXXXth ISCEV Symposium will be organised by Werner Spileers in Leuwen, Belgium. For the XXXXIth ISCEV Symposium we have an invitation to Nagoya, Japan, by Y Miyake.